Finding birthday cake recipes that are both delicious and healthy is a challenge—and when you add the often variable appetites of toddlers into the mix, it can almost seem impossible. 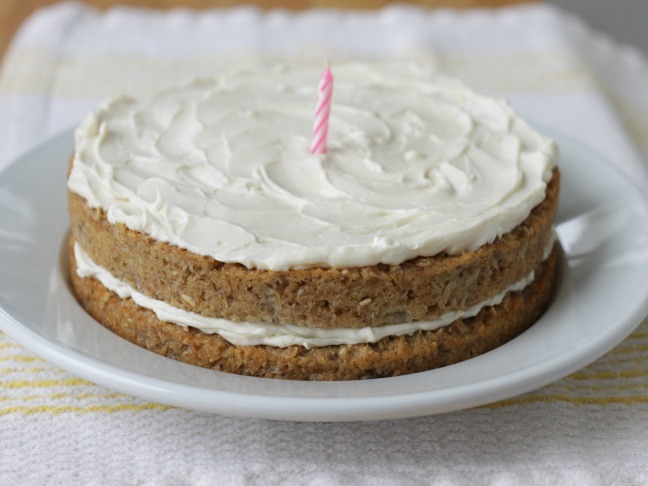 But this banana bread birthday cake is one of our favorites to celebrate a special occasion (or just a random Thursday afternoon). It’s moist and incredibly flavorful, and it boasts a rich and creamy frosting. Your kids will love how yummy it tastes, and you will love that it’s actually filled with nutritious ingredients. 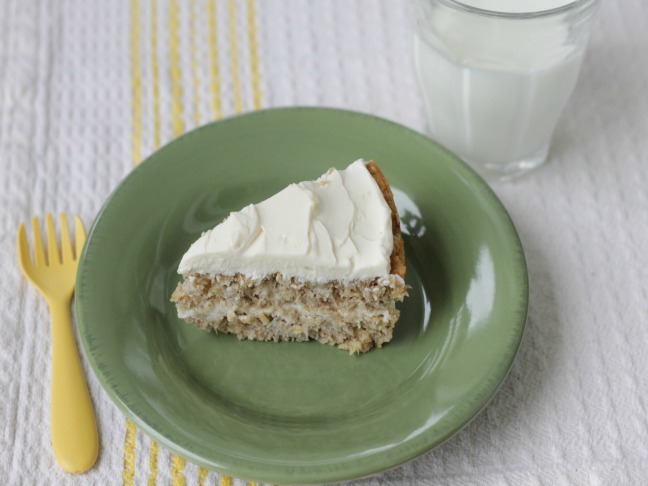 We like this cake because it tastes like banana bread, but it has the added benefit of frosting. You could add in some raisins, chopped walnuts, or even chocolate chips to make the batter extra special, though it’s pretty great in this simple form. 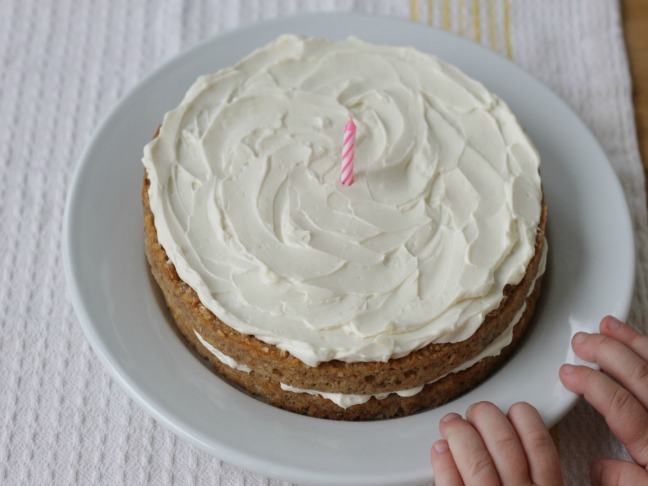 This banana cake would make a wonderful option for a first birthday party since it’s naturally sweetened and is easy for toddlers to eat—and because it’s so easy for adults to make without the need for any special appliances or ingredients. In fact, you probably already have the ingredients in your kitchen! Try serving it with cold milk for the kids and strong coffee for the parents for a birthday treat everyone will love. Your kids will love how good this tastes, and you'll love the nutritious ingredients. Step 1: Preheat the oven to 350 degrees F and grease two 8-inch cake pans well. Place the oats, coconut, baking powder, and cinnamon into the bowl of a food processor. Grind until the oats resemble a coarse powder, about 30 seconds. Step 2: Mash the bananas very well in a medium bowl. Gently stir in the eggs, vanilla, butter, maple syrup, and the oat mixture until well combined. Divide the batter between the prepared cake pans, spreading gently with a spatula until even. Bake for 28–30 minutes or until a cake tester inserted into the center comes out clean and the edges are starting to brown. Remove from oven and let cool completely in pans on a wire rack. Step 3: To make the frosting, beat the cream cheese, butter, honey,* and vanilla in a medium bowl with an electric mixer until light and fluffy. Step 4: Carefully remove one cake from the pan and place onto a serving plate, using a spatula to help as needed. Top with half of the frosting and spread to the edges. Carefully remove the second cake from the pan, using a spatula as needed, and place on top of the frosted cake. Top with the rest of the frosting, spreading evenly to the edges. Serve immediately, or place in the fridge and serve chilled. To store: Cover with plastic wrap and store in the refrigerator for up to three days. *You can also use maple syrup in the frosting if you prefer.